Our Kindergarten program encourages the development of the mind, body and soul of young children. We believe every child is a precious gift from God. Our program facilitates interaction with other children and adults, in an atmosphere of Christian love and concern, which promotes the healthy development of each child. from 6:30 PM to 7:30PM at the Parish Center (GYM). Come and meet the teachers and get valuable information regarding the upcoming Kindergarten Screening which is coming up on April 8th & 9th. Adults only please. This meeting is mandatory for at least one parent of a registered kindergartener for the 2019-2020 school year. Our kindergarten curriculum, established by the State of Ohio and Diocese of Cleveland, will engage students in activities that encourage the continued development of cognitive language and math skills infused with science including a special Astronomy night in September, language, art, music, physical education, and outdoor play. The integrated curriculum is based on how children learn best and will allow each child to make meaningful connections in their learning. In addition to the core curriculum, Kindergarten students participate in co-curricular studies including Art, Music, Physical Education, Technology and Library classes, as well as have the opportunity to take part in some CYO sports and Spanish Club. Continue to develop foundational cognitive skills by learning through experiences in: Math, Science, Language, Social Sciences, Religion, Art, Music, physical movement, play and field trips. Grow their understanding of Christian values. Integrate technology into their education experience. Successfully transition to first grade. Our kindergarten program is full time, Monday – Friday; 8:00 AM – 2:50 PM. Students also participate in lunch, weekly Mass and Extended Day, if needed. Students must be 5 years old by August 1 to attend Kindergarten. 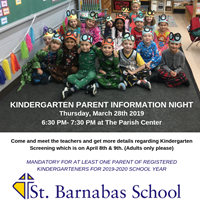 If you have questions or would like to get more information about our Kindergarten program, please complete our online Request Information Form or contact our Admissions Department at (330) 467-7921 or email admissions@barnabasohio.org.